Narcissus – Dig Delve – An online magazine about gardens, landscape, growing & making. The first spring here revealed the extent of the garden around the house. A bright blue line of muscari along the path to the front door and a bolt of daffodils pushed up tight against the hedge where the grazing became too tight for the cattle. I came to rather like the muscari since they were out on the day my father first visited. We pulled him from the car and corrected his balance and for a moment, as he took in the breeze and the view, his jumper was a perfect match. He liked a bit of colour and was never afraid to use it, but I learned quite quickly that it is a medium that has to be used judiciously on our hillside. The daffodils are a case in point. Compare them to the pinpricks of golden celandine or pale primrose that pepper the very same hedgerow and you quickly see them as an unnecessary distraction that sits uncomfortably in scale and intensity. 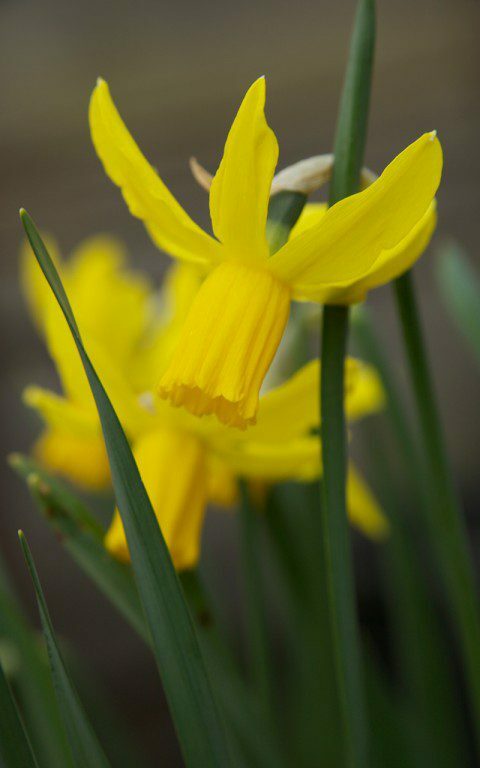 We picked the large golden florist’s daffodils planted by the previous owners to enjoy their earliness inside and resolved to trial any new ones in pots before committing them to the grass. 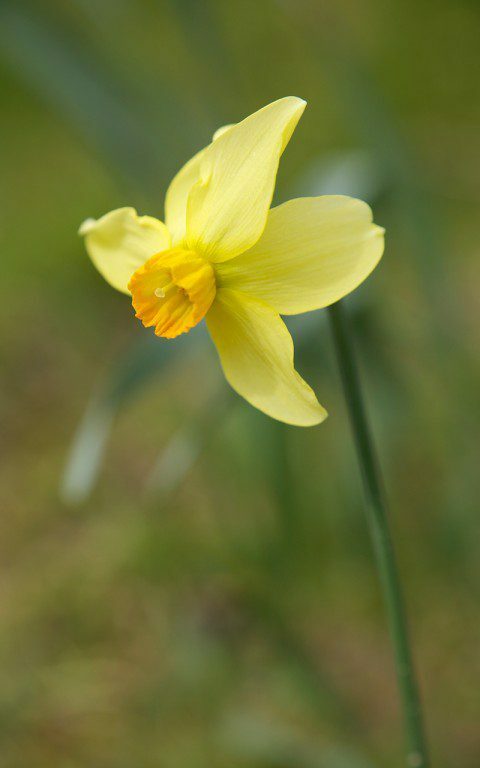 I had already started to get to know the small-flowered narcissus in London by growing a number each year in pots, so I drew up a list and set out a dozen or so varieties to grow in rows in the vegetable garden. 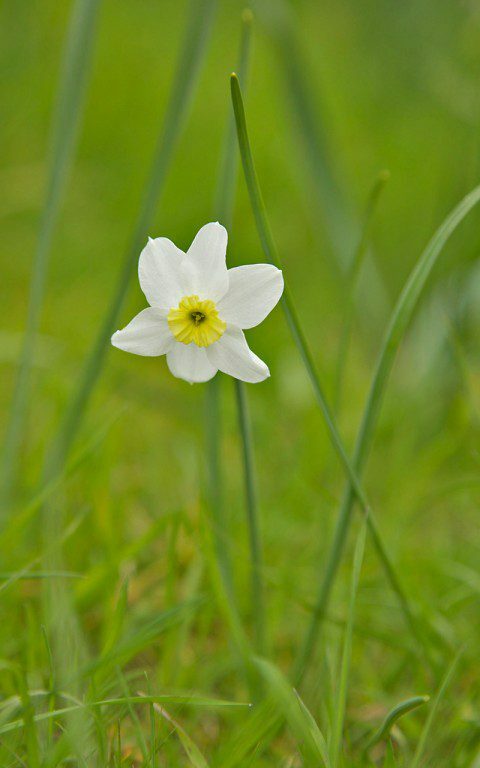 Bulbs provide easy, early colour, but they are not easy to remove once growing in the sward. 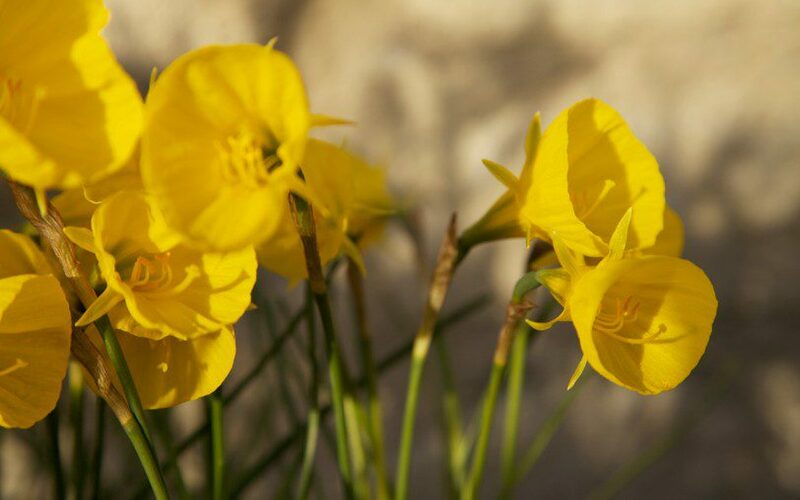 If you don’t like them when they bloom, the moment to remove them is right there and then, but in spring there is never a good time to wade in and dig up the offending bulbs without ruining the up-and-coming grass around them, or trampling those varieties you want to keep. I found out that even some of the small-flowered varieties that looked wild enough in London feel far more cultivated and out of place here. Even in the area behind the house where I have upgraded the pasture through the addition of crab apples. 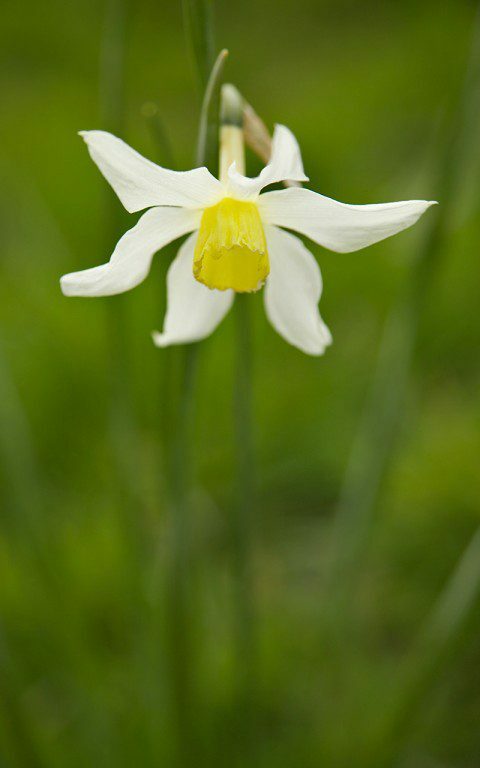 The varieties that have worked are those which have the informality of the wild Narcissus pseudonarcissus. I like the twist in the outer petals, the pale rather than saturated yellows and their modest stature that sits well in grass and does not dominate. Of the brighter golds, my favourites are the small-flowered and those with fine, grassy foliage, which blend more readily into the sward than those varieties with large, strappy leaves. Similarly those with too glaucous foliage stand out unnaturally against grass. The slope behind the house where I have planted the crab apples is better for being planted lightly, with just a scattering. Contrast of form keeps a narcissus collection feeling light. 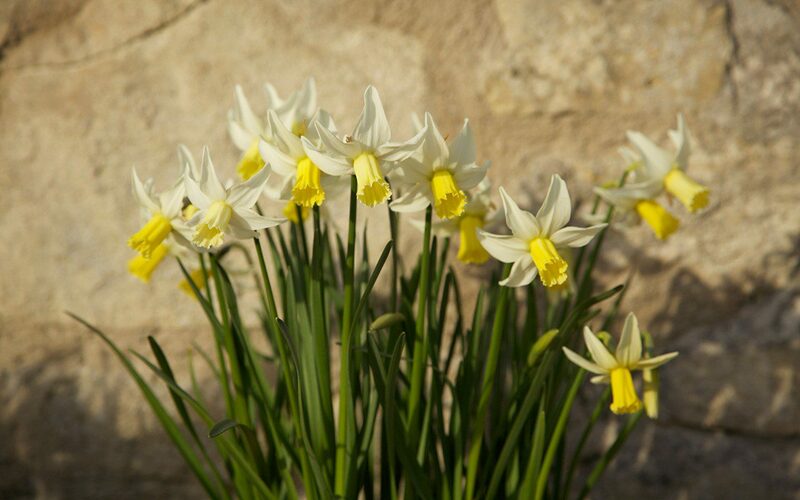 The tiny lemon-drops of Narcissus ‘Hawera’ alongside the pale, flattened faces of N. ‘Glory of Lisse’, and the almost white N. ‘Colleen Bawn’, for instance. A number look best when there are just a handful of varieties blooming at any one time in association. 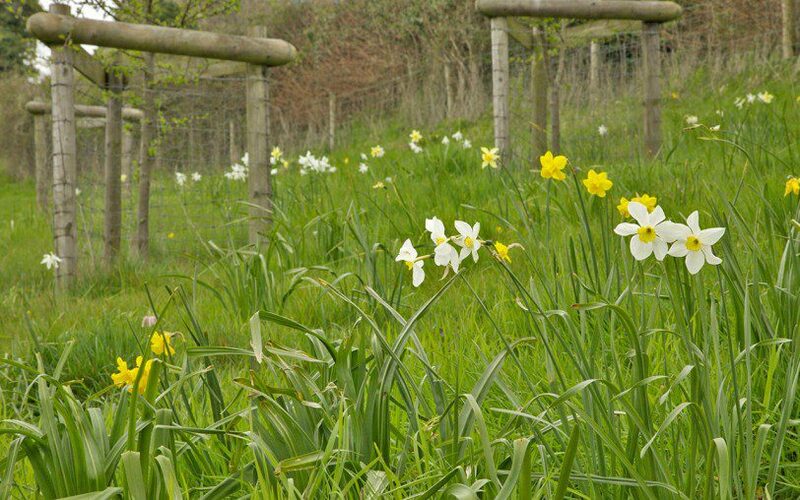 As their season is long – a good eight weeks with N. ‘Snipe’ overlapping snowdrops and the pheasant’s eye, Narcissus poeticus, accompanying the apple blossom – I have been able to incorporate a number of varieties without it looking like a hit-and-miss mix. 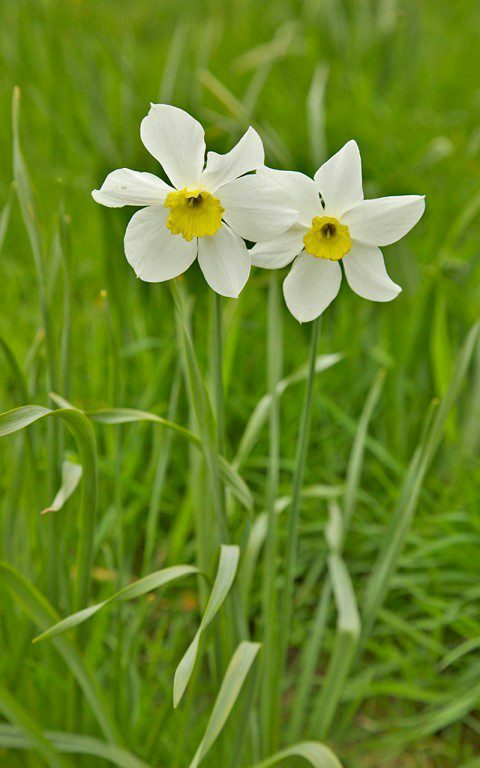 I will return to narcissus at bulb planting time in the autumn to update my thoughts and no doubt in springs to follow, for it is hard to stop experimenting. There are so many to choose from, but these are some of the best that are working well here. The selection held by Shipton Bulbs has been an inspiration. John Shipton carries a number of the heritage varieties which, on the whole, have a delicacy that is often lost in modern breeding. Ron Scamp also stocks a wide range of specialist varieties. N. ‘Mrs. 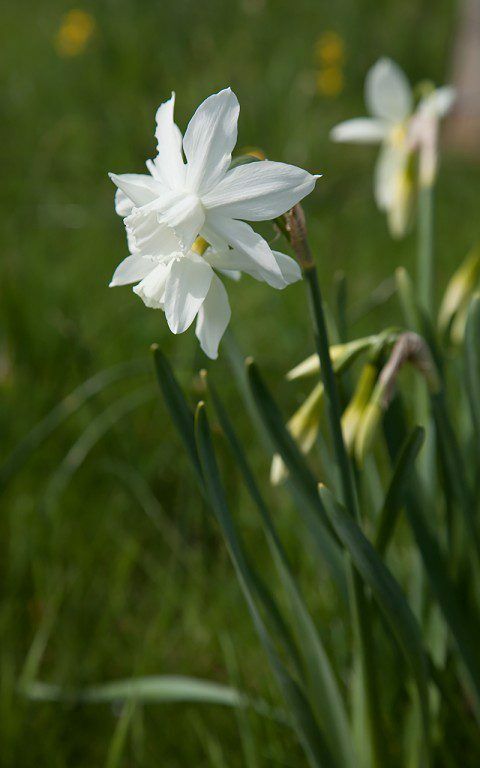 Langtry’ is a fine example with a twisted windmill of creamy-white petals and a clear yellow cup. N. ‘White Lady’ is similarly delicate, while the fittingly star-shaped flowers of N. ‘Stella’ are a creamy yellow with a darker gold cup. Given our location I couldn’t help but try N. ‘Bath’s Flame’. 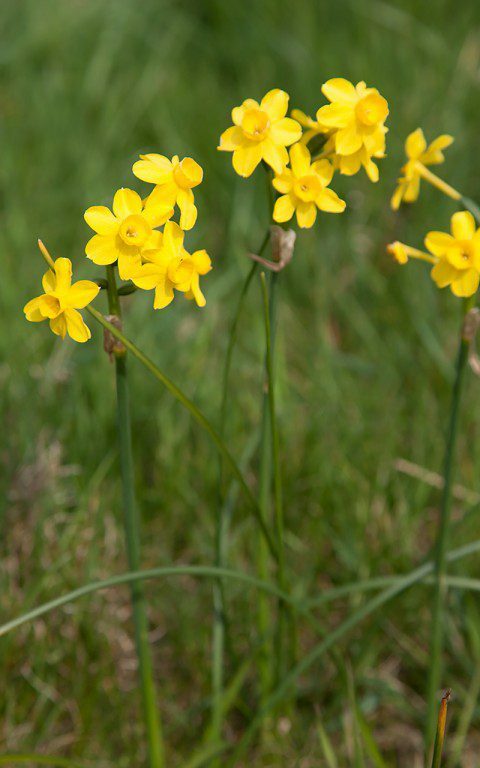 It has petals which open a bright lemon-yellow, maturing quickly to the colour of butter. Its heavily pleated cup is of a darker yellow that appears to have been dipped in bright orange ink. However, the flowers have shown themselves to be altogether too bright and glamorous for grass, and they are tall, and the flowers large, so easily blown about and broken on our breezy slopes. Once I set up the garden I’ll try to find them a place. The orange rim on the cup could be good with the emerging foliage of peonies. 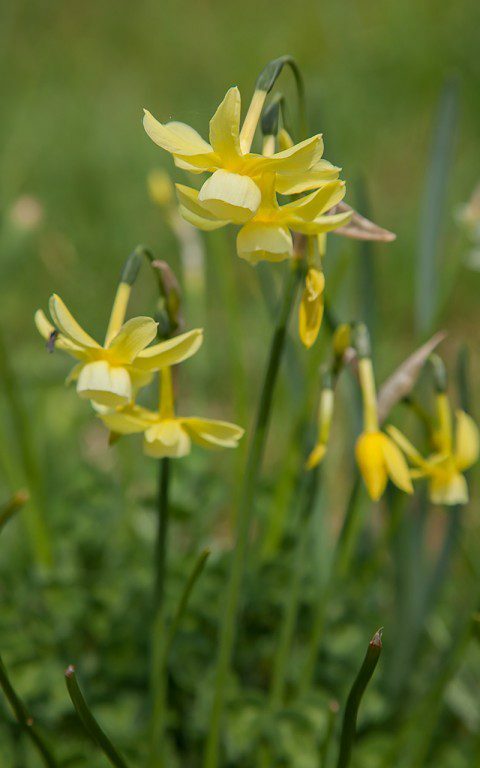 The Narcissus cyclamineus varieties with their flung back petals are a delight. They are perky and resilient and never too big or too small in scale. N. ‘Jenny’, a perennial favourite, had been out of stock for several years, but seems once again to be available. I love how the trumpet starts a bright, clean yellow, maturing slowly to ivory. N. ‘Beryl’ was one of the first cyclamineus hybrids, and has a wild elegance, with soft lemon petals and a pale saffron cup. I like N. ‘Little Witch’ too. 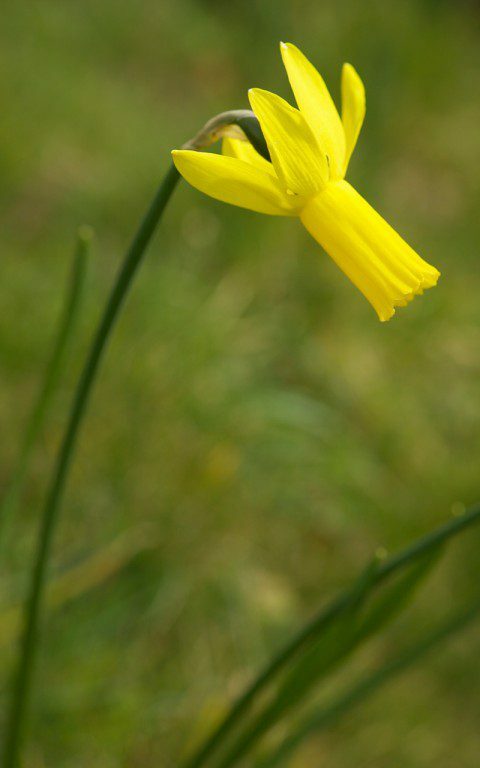 For a saturated gold daffodil it is very light on its feet. N. ‘Rapture’ has a similar character, but is taller and has a longer trumpet, which make the flower duck and dive in the wind. 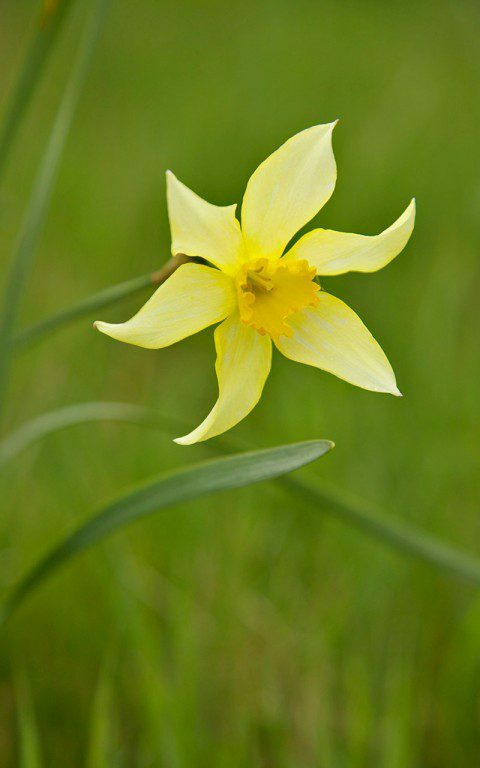 Its backward-facing petals give it an endearing windswept quality. 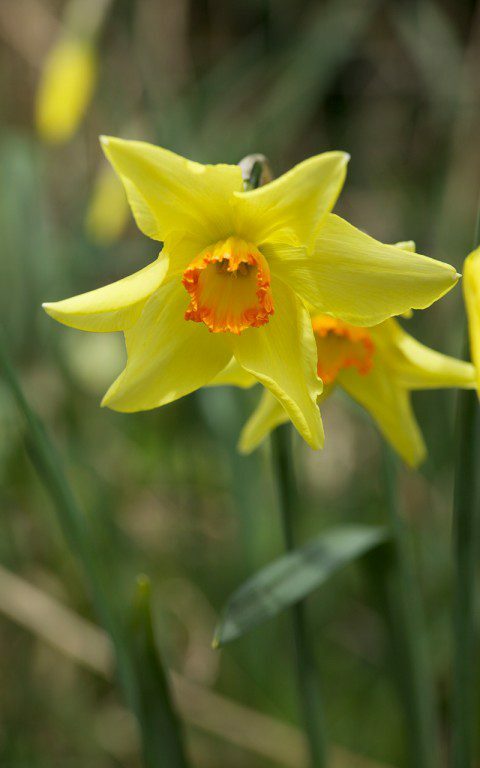 I prefer to keep the percentage of these golden daffodils lower amongst a predominance of paler varieties, but they are enlivening and prevent varieties such as N. ‘Thalia’ from feeling too wan and ghostly. 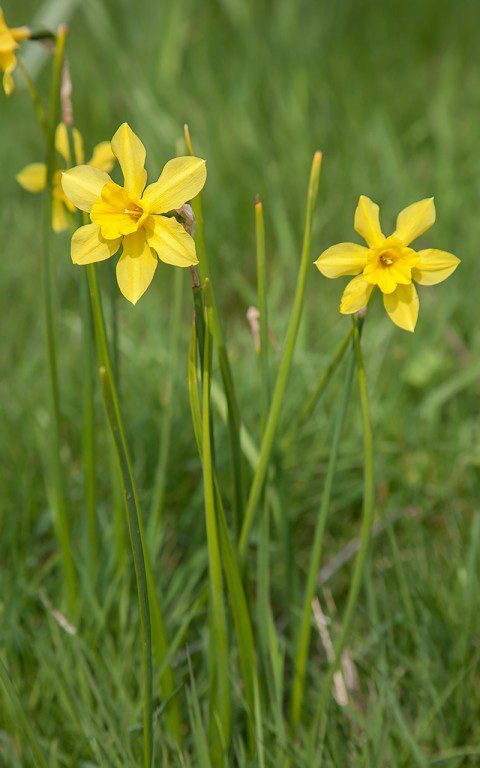 Narcissus bulbocodium is lovely for the animation in the flower, which bobs on wiry stems just inches above the grass. I have seen sheets of them flowering in meadows in the Picos de Europa, their golden hoops quivering and shaking in the breeze. N. b. ‘Oxford Gold’ is as bright as it’s name suggests, while N. bulbocodium subsp. bulbocodium var. 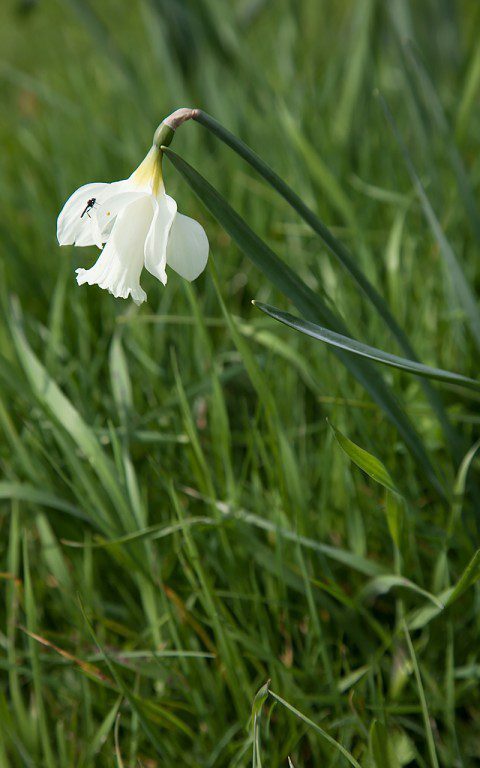 citrinus is a sophisticated pale primrose. In grass this species tends to seed itself, rather than forming clumps. N. jonquilla, best known for its delicious perfume, is worth seeking out over the named, less delicate varieties of this species. Its strong gold colour is leavened by its diminutive stature and its rush-like foliage disappears in grass. 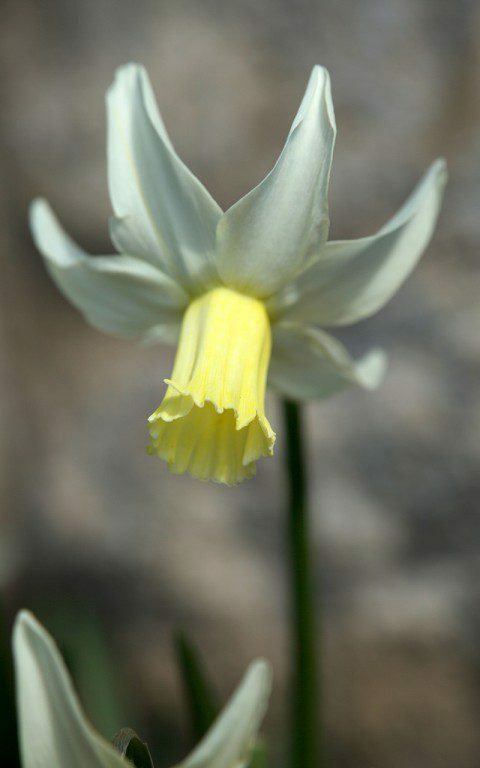 I have Narcissus x odorus too, believed to be a wild cross between N. jonquilla and N. pseudonarcissus, which has been in cultivation since the 17th century. N. ‘Segovia’ is tiny and perfect and one of the latest to flower. It is pure white with a crimped and flattened lemon cup and is highly scented. 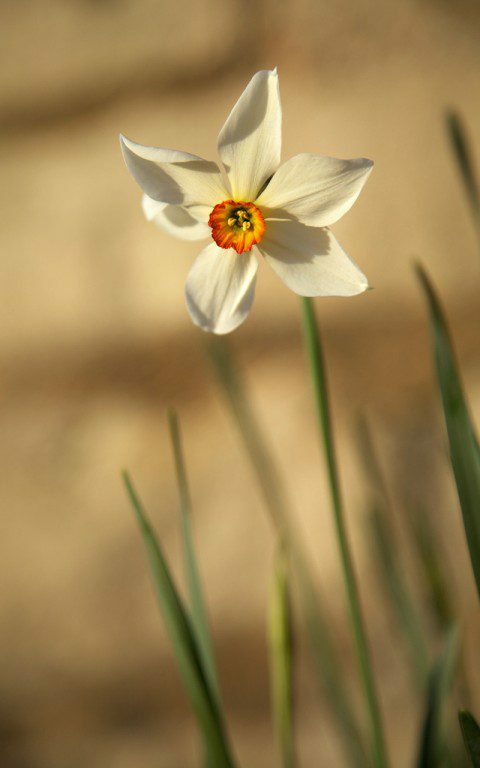 A few go a long way and are welcome for being on the later side of the narcissus season. Enjoy the last of them now. They will very soon be lost in grass with their companions.